If you like Apricots in the winter for cobblers, pies or just in a bowl; just imagine how good it would taste if you had picked a couple of quarts fresh or bought a them from a farm stand and then quickly froze them at home! It is also one of the simplest ways to put up a fruit for the winter. Here's how to do it, complete instructions in easy steps and completely illustrated. In the winter when you pull them from the freezer, the fruit will taste MUCH better than anything you've ever had from a store, and by selecting the right fruit, it will use less sugar than store-bought frozen apricots. Apricots can be packed in very light, light or medium sugar syrup. They can also be packed in water, apple juice or white grape juice. 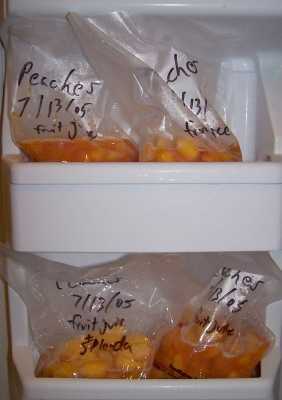 Prepared this way, the frozen fruit will have a freezer life of about 12 months, and aside from storing in a cool, dark place, require no special attention. 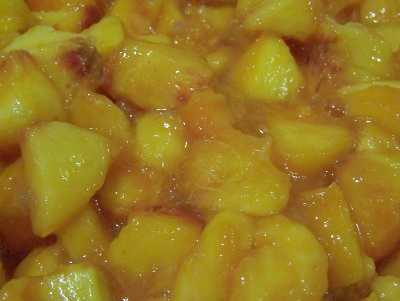 If you would rather can your fruit, see my page on how to make home canned apricots from fresh! It is really SO easy! And here are some great and easy apricot and peach desert recipes! The most important step! 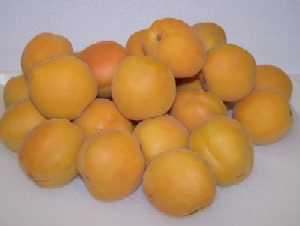 You need apricots that are sweet, and to make the work easier, cling-free (also called freestone). This means that the apricot separates easily from the pit! Same with nectarines, and this doesn't apply to cherries or plums. Choose ripe, mature fruit. They should not be mushy, but they also should not be rock hard: just as ripe as you would eat them fresh. Green, unripe apricots will soften but will not ripen, nor have the flavor of tree-ripe apricots. After this step, I'll just refer to "apricots" but it applies to plums, cherries and nectarines. 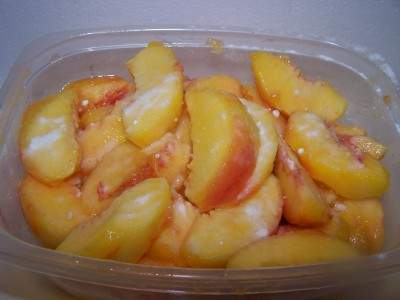 It takes about 5 good sizes apricots or nectarines (or about 10 plums) to make one quart or frozen apricots. Apricots must be packed in a solution of water and sugar or fruit juice. It's up to you which to use. Sugar is added to improve flavor, help stabilize color, and retain the shape of the fruit. You only need enough solution to cover the apricots; about 1 cup per quart. It is not added as a preservative; but the solution does prevent drying, freezer burn and oxidation (browning). Peach, white grape or apple juice works great and is a natural alternative to using processed sugar! Fruit juice syrup requires no preparation. To prepare sugar and Stevia (in a prepared form like Truvia, it measures same as sugar; if you use another form, you'll need do your own conversion) - or Splenda, if you prefer, syrups, while heating the water in a pot on the stove (or microwave), add sugar slowly, stirring constantly to dissolve. 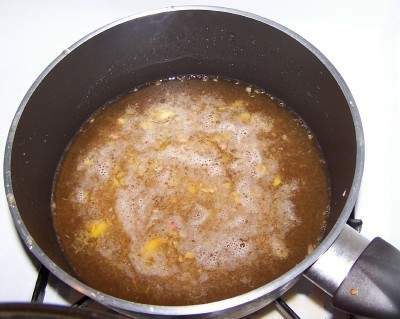 Once it is dissolved remove it from the heat. After preparing the liquid syrup, let it cool before mixing it with the apricots! Step 4 -Wash the apricots! I'm sure you can figure out how to wash the apricots in plain cold or lukewarm water. NOTE: this works GREAT on ripe apricots, but if the beaches are rock hard, not so well. Best to let the apricots soften for a day or two first! Nectarines do not need to be peeled, if you don't mind the skins. Neither do apricots, but most people prefer them with skins off - they tend to be slimy after all this. Cut out any brown spots and mushy areas. 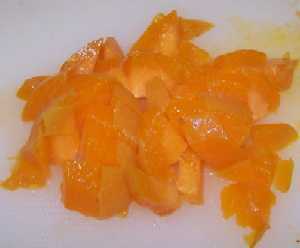 Cut the apricots in half, or quarters or slices, as you prefer! Remove pits! 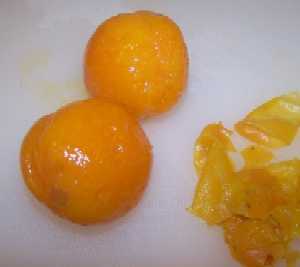 Apricots will turn brown when exposed to air, even air in a sealed, sterile jar. To keep the fruit from turning brown, when you get a bowlful, sprinkle 1/4 cup lemon juice or Fruit-Fresh (which is just a mix of citric acid and vitamin C, perfectly natural). 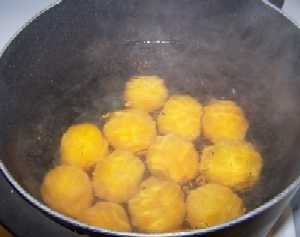 Then stir the apricots to make sure all the surfaces have been coated. In a large bowl, combine the apricots and sweetener solution. Mix completely. Ladle the apricots and solution into the freezer bags. If you are using ziploc bags, squeeze out any air bubbles and seal them. put them in the freezer on the coldest shelf. 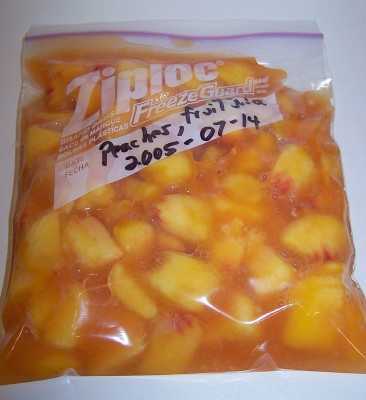 Since apricots, nectarines, plums, figs, and other soft fruit will be covered in a liquid, it is quite easy to remove all the air with a ziploc bag! Be sure to use the "freezer ziplocs", not the regular ones. The freezer ones are thicker and will be much less like to break, split or allow freezer burn. TIP: If you don't own a vacuum food sealer to freeze foods, place food in a Ziploc bags, zip the top shut but leave enough space to insert the tip of a soda straw. When straw is in place, remove air by sucking the air out. To remove straw, press straw closed where inserted and finish pressing the bag closed as you remove straw. 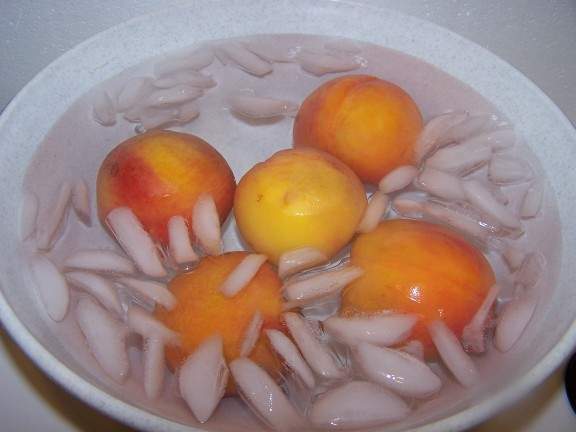 If any of the frozen apricots are exposed on the surface, just pour a little more sugar syrup (or fruit juice, etc.) to cover them and put it back in the freezer. When that freezes, you can seal them. Apricots in foodsaver bags standing upright, unsealed, in the freezer; to be frozen. Apricots in a ziploc bag with the air excluded, ready for the freezer. Q. Can I freeze apricots dry without any sweetener? A. Yes. 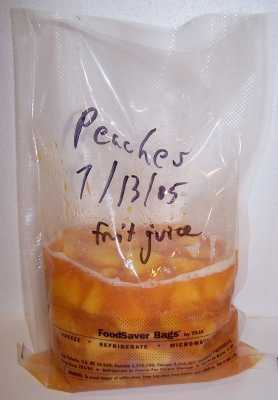 You might get some freezer burn, so you might want to add a little juice (peach or white grape) to fill the air spaces. Or pack them dry using a vacuum food sealer which would eliminate the need to add juice and still avoid most freezer burn. If you do dry pack, to prevent darkening, dissolve 1/2 teaspoon (1500 mg) ascorbic acid (also known as "FruitFresh") in 3 tablespoons water and shake the apricots in a bag with this solution to coat evenly, then freeze.